The Quintus QIH-15L HIP system will play a key role in supporting advanced process development and production at CIDESI, one of Mexico’s top research and innovation organizations. The Quintus HIP is recognized as the best quality system for performing Hot Isostatic Pressing of advanced materials for demanding applications, especially within the aerospace, automotive, and energy sectors. 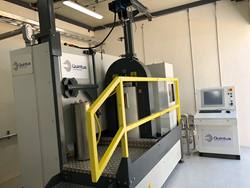 The Center for Engineering and Industrial Development (CIDESI) in Querétaro, Mexico, has purchased and installed an HIP system from Quintus Technologies®. The HIP system, a QIH-15L, is recognized as the best quality system for performing Hot Isostatic Pressing (HIP) of advanced materials for demanding applications, especially within the aerospace, automotive, and energy sectors. The Quintus HIP system installed at CIDESI features a work zone of 7.32 inches (186 mm) in diameter and 19.69 inches (500 mm) in height; an operating temperature of 2552° F (1400° C); and pressure of 207 MPa (30,000 psi). Supporting advanced process development and production at CIDESI, the HIP is equipped with Quintus’ patented Uniform Rapid Cooling (URC®) technology. “Quintus Technologies has for several years worked with universities and research institutes in the development of education in many research areas, in North America and globally. We are honored to have been selected by CIDESI to deliver this HIP system. It proves our commitment to deliver reliable HIP systems to this educational and specialized technological sector,” comments Jan Söderström, CEO of Quintus Technologies. Founded in 1984, the Center for Engineering and Industrial Development (CIDESI) is part of a System of Research Centers managed by Mexico’s National Council of Science and Technology, CONACYT. CIDESI contributes to the development of the country’s industrial sector through research and innovation projects, as well as highly specialized technology services. Its postgraduate studies programs are accredited with the National Registry of Quality Postgraduate Programs. CIDESI is certified under the lSO-9001:2008 standard and is the first CONACYT research center to be certified under the AS-9100C aerospace standard. CIDESI has been distinguished with the Mexican National Prize for Technology and the State of Querétaro Export Award. It offers contract research and technological services in the following areas: applied research, electronics, aerospace, mechanical systems, manufacturing, oil industry technology, materials technology, and metrology, among others.